A bustling, tree-lined plaza — the center of community life in Ocuituco, Mexico — is now a place for the city’s residents to get the medical care they need. In the state of Morelos, where Ocuituco is located, a 7.1-magnitude temblor damaged 24,000 buildings in September. Centro de Salud de Ocuituco, a health center that serves about 4,500 patients, was among those to sustain damage. The town’s hospital is still operational but is several miles outside of the town’s center, requiring patients to walk the distance or hire a car — expensive in the mountainous region. 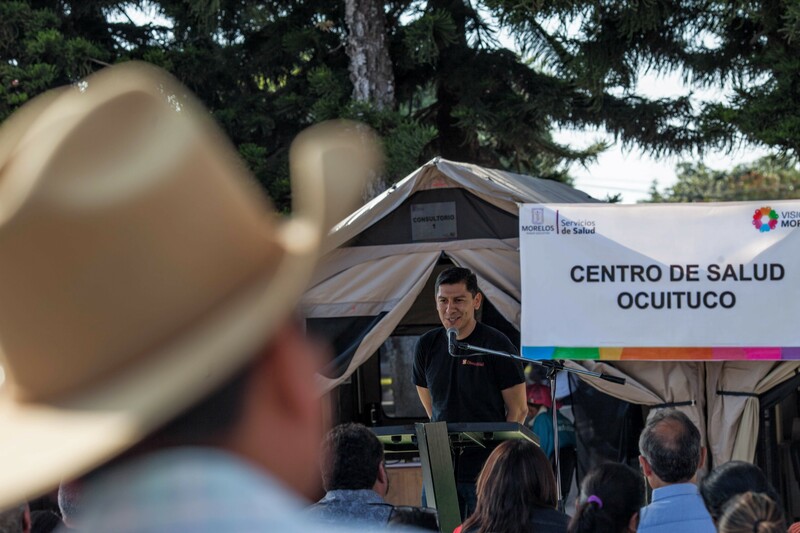 To help patients access health services closer to their homes, Centro de Salud de Ocuituco built a temporary clinic comprised of six tents, which have running water and power, in the town’s center. One tent is being used by clinic staff to register patients. Another, complete with a refrigerator for vaccines and other medications that require cold storage, is being used for preventive medicine. The others are being used for patient visits and pharmacy use. The tents, which were provided by Barebones, are also being used as temporary clinics and field hospitals around the world, including in Syria, Nepal, and Bangladesh, where healthcare providers have set up medical outposts to treat Rohingya refugees. — Dominic Bracco II is a journalist in Mexico City.